Finca El Tossal is one of those places that you probably won't have on your bucket list because it is a little out of the way. However, it proves beyond any doubt the quality of sleeping hideaways presented by I-Escape, one of the best boutique hotel web sites around for intimate, well designed, reasonably priced hotels. And when you stay in this mountainside retreat with views of the mountains and the ocean in the distance you will tell every Nomad you know that it belongs on theirs. To make it even better, a delicious breakfast is included and you can purchase dinner for a reasonable price, which I highly recommend. With extremely friendly, super competent owners and a chef that we wanted to take home with us, our stay in this small, boutique hotel in the mountains with amazing views from a well appointed room with an immensely comfortable bed and a small balcony garnered a ten plus rating in our book. It was the perfect place to simply R & R after some pretty busy sight seeing for several days prior to arrival. I agree with Rick Steves, who recommends a "down day" every few days, to keep your head and your heart balanced and rebuild your energy for things yet unseen. We just relaxed, swam in the pool and ate great food. We only ventured out one evening and took the thirty minute drive to the beautiful coast and found a great little seafood restaurant - Saltea Restaurante. Delicioso! 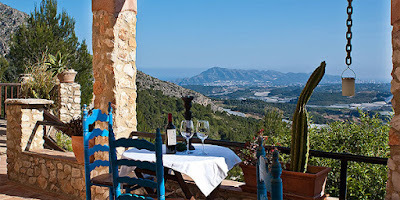 For a quick view of this restful place in Southern Spain, check out the following You Tube. Though we didn't want to leave, the rest of España beckoned. After three nights and days at the perfect place to just enjoy being in this amazing country, we headed out for our next adventure, Valencia. After three relaxing and restful days and nights, Finca El Tossal is on my Top Ten List Of Ridiculously Amazing Places To Sleep for All Nomads! Remember - “All journeys have secret destinations of which the traveler is unaware.” — Martin Buber. That says it best. This week's video blast comes from one of the truly great Texas Troubadours. The one and only Lyle Lovett, with his Large Band, performs one of his greatest , most thought provoking tunes from one of his greatest recordings - Joshua, Judges, Ruth - live - the song - CHURCH! Because of our plans to venture away from metropolitan areas, we rented a sweet little Fiat 500 L for five days for a measly $34.00 per day, from Hertz no less, and headed for Granada. Spain, on the road, is a beautiful country. And the small enclave of Granada is the perfect place to walk and enjoy the sites and sounds of a beautiful town with a world class UNESCO World Heritage Site - Alhambra. Our small, boutique 4-star hotel, Gar Anat Hotel Boutique, has only fifteen rooms and is located in the center of the small town, so you can walk everywhere to restaurants and other cool places to, see. Due to our plans for the remainder of our trip, we broke our Nomad Rule (minimum three nights) and stayed only one night at this small, intimate hotel. The low price of $170.00 included a beautifully appointed room, complimentary wine, snacks and breakfast. 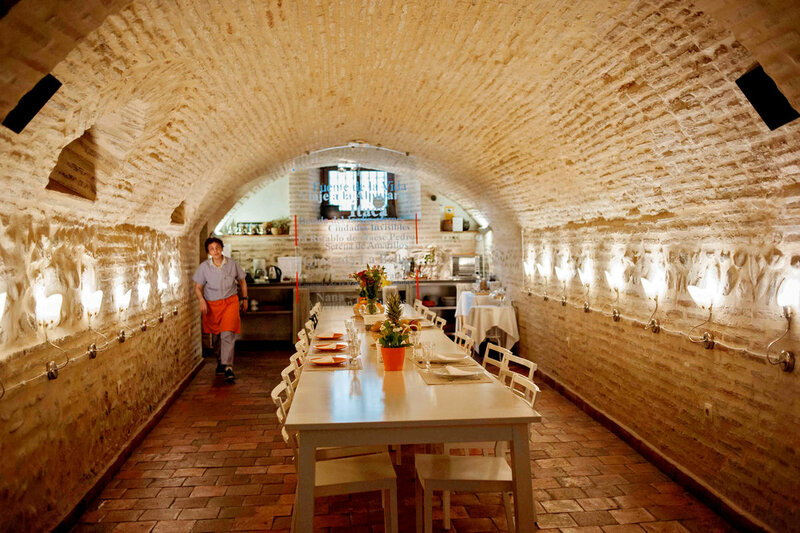 Which, as you can see in the photograph, is served in a stone vaulted room that combines ancient and modern to perfection. All good! This small higher end hotel, at the price it charges, further supports this Vagabond's advice to go to Spain to see some of the best designed places in Europe for a song, compared to the rest of Europe. Due to its size and complexity, I highly recommend that you book a tour with one of the local tour companies. We used VIATOR, which is affiliated with Trip Advisor. Our guide/docent was full of great information about the details of this magnificent structure. Another recommendation is to plan your visit to be an all day trek. Next Up: We head to the country to one of the coolest places I-Escape presents for Nomads to lay their heads while enjoying the countryside, great food and simple relaxation. After getting settled in our contemporary studio the yellowBox, our AIRBNB place to sleep for three nights and getting the scoop on what to do and where to go from the owner, we started walking, riding and seeking out those places that we knew about and hopefully some places we didn't. 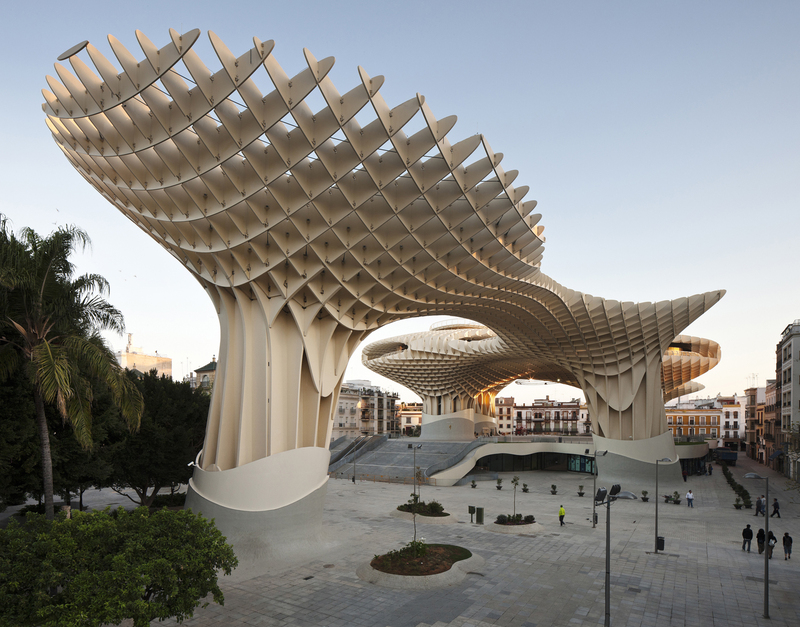 One of Seville's more interesting architectural structures is Metropol Parasol. Designed by German architect Jurgen Mayer, this fascinating structure is claimed to be the largest wooden structure in the world. It is commonly referred to as Las Setas de la Encarnación (Incarnation's mushrooms). As you would expect just looking at it, it was very controversial due to its appearance, location and cost overruns. At a cost of $55 million Euros and a two year construction period, it is well worth an afternoon to explore. 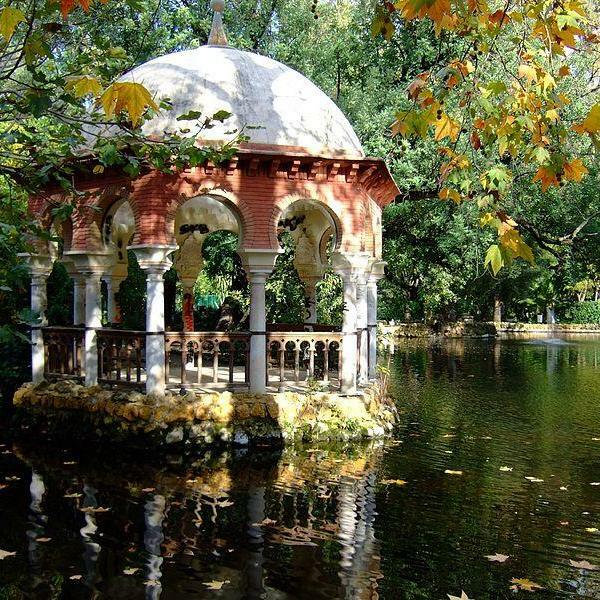 In the heart of a city of about 800,00 lies one of the most serene, beautiful and natural places you will ever see - Parqu de Maria Luisa. In addition to the natural areas of the park, you can also enjoy the Plaza de España, an excellent example of regionalism, built in 1928 for the 1929 Ibero-American Exposition of 1929 (Worlds Fair). You can walk throughout the park and then see the massive masonry structure as well, or you can enjoy it all from a horse drawn carriage. We spent an entire afternoon just enjoying the trees, plantings, water features and other places of quiet and peaceful solitude in the park as well as the magnificent Plaza and the huge half circle building. The plaza and building have been seen in various movies, including Lawrence of Arabia and Star Wars. And where better to enjoy the real thing than in Andalucia's capital - Seville? 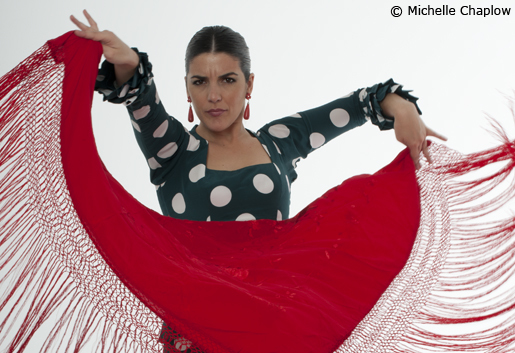 There are many places where you can see the grace, athleticism and passion of the Flamenco. However, we took our AIRBNB owner's recommendation and decided to see this beautiful art form in a very small, intimate club - Los Gallos Tableo Flamenco. No over production. No smoke and mirrors. Only guitarists, dancers and, for lack of a better term, hand clappers. We enjoyed 90 minutes of incredible entertainment with extraordinarily talented and passionate dancers, singers and rhythmic clappers. Below is a quick video of just some of the amazing dancing of the art form that takes its name derived from the word fire. So when you go to Seville, be absolutely sure that you check out the dance that was invented by this beautiful art filled country for all to enjoy. I Wanna Be A Baile Loco!! P.S. - For those vagabonds that want to hear a new twist on the blues, check out this video from three time Gammy winner Keb Mo performing Old Me Better - Good Stuff!